Gusting winds, sweltering heat and predictions for thunderstorms didn’t dampen the enthusiasm of local REALTORS®, friends and sponsors at the REALTORS® Association of Hamilton-Burlington’s (RAHB) 20th annual Charity Golf Tournament. Held this year at the Beverly Golf and Country Club, RAHB’s Charity Golf Tournament raised $7,022 for two local emergency women’s shelters: Interval House of Hamilton and Halton Women’s Place. In addition to their emergency services, both shelters offer outreach and support networks. Interval House of Hamilton has three community-based programs that focus on peer support, counselling and legal advocacy. Halton Women’s Place implements strategies and educational programs that inform and empower women to make decisions about their safety, rights and options. 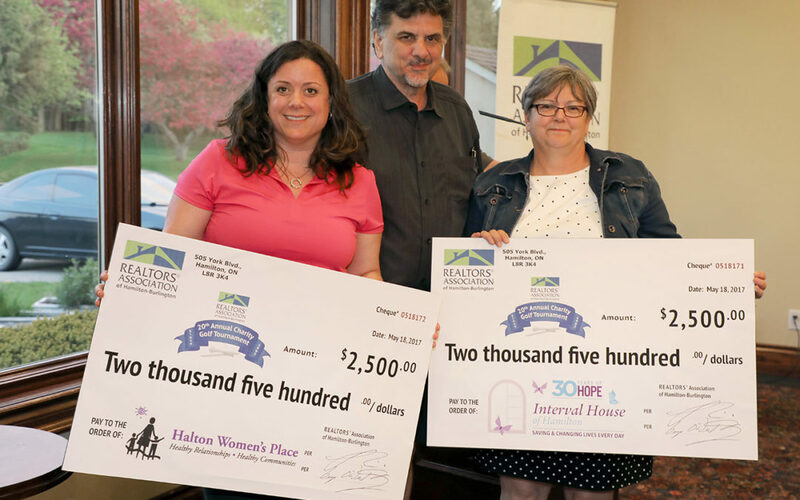 Representatives from both Interval House of Hamilton and Halton Women’s Place were on-hand to play in the Charity Golf Tournament and received $2,500 donation cheques at the end of the tournament. Each organization received additional funds once the proceeds were tallied. The REALTORS® Association of Hamilton-Burlington believes in assisting local shelter-related organizations in the Greater Hamilton-Burlington. For more information about whether your organization qualifies for a donation, visit www.rahb.ca/givingback. Photo: RAHB President Lou Piriano presenting Laurie Hepburn from Halton Women’s Place and Nancy Smith from Interval House of Hamilton with a donation cheque.